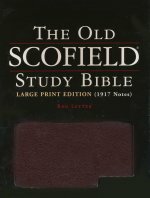 Description: Dr. C. I. Scofield's classic study system and 1917 notes form the core of this definitive resource. A crisp red- letter typeface enhances this Bible's usefulness. Large, 10-point print makes this edition particularly attractive for preacher and people with vision difficulties. Features include book introductions, chronologies, concordance, subject-chain references, comprehensive and subject indexes and full-color Oxford Bible Maps, with index.